Insufficient UPS capacity and lack of central management capabilities were challenging the County`s ability to ensure high availability to its data center. 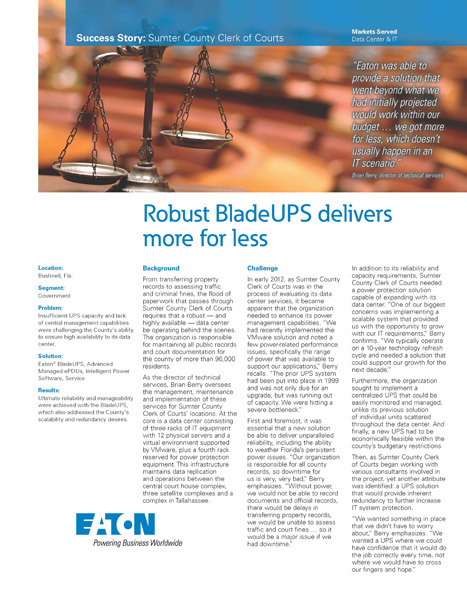 Ultimate reliability and manageability were achieved with the BladeUPS, which also addressed the County`s scalability and redundancy desires. Sumter County Clerk of Courts was suffering from power-related performance issues as its prior UPS was running out of capacity and needed an upgrade. Because the organization is responsible for all county records, it was essential that a new solution be able to deliver unparalleled reliability, including the ability to weather Florida`s persistent power issues. After assessing a variety of UPSs from multiple manufacturers, the County found what it was seeking and more within the BladeUPSs. The organization supplemented the 24 kW UPS with an Eaton rack, Advanced Monitored ePDUs and a service plan.